Last week I announced my Declutter Challenge. I invited all of you busy folks out there to work with me to get rid of the clutter in our lives. 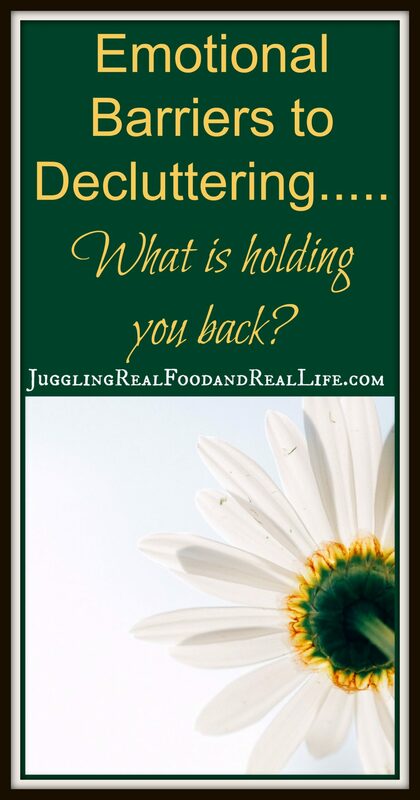 You can read more about the Declutter Challenge for Busy Folks here. I have been working each day to declutter my master bedroom. It is a place that the whole family seems to want to dump their clutter. If in doubt, put it in mom’s room seems to be how my family thinks. Ugghhh! Why me?? While I was able to quickly make progress in decluttering the room, I noticed that I kept passing over certain items. I was not sure what to do with them. That got me thinking. Why were these items difficult to discard or put away? I now realize that clutter is so much more than items that need to be thrown away or put away. We carry a lot of emotional baggage with our clutter. I found myself being sentimental about things and worrying about needing things. If I feel this way, then I bet a lot of you do too. What are these emotional barriers to decluttering?? We are just going to mess it up again, so what’s the point? As always if you are looking for help in making the transition to eating more real food, you should check out the Real Food Experience posts. You can get started at the beginning or jump around the challenges. You can find a complete round-up of the program here. Each week’s challenge is full of terrific advice to help you transition from fast and processed food to a real food diet. Changes that will help you to live a healthy lifestyle and have the energy to keep up with your busy schedule. I would also love for you to join me on social media. You can find me on Facebook, Twitter, and Instagram on a regular basis. Leave me a comment and let me know you are there. I love to visit with my readers. I’m doing massive decluttering this year and it’s interesting to hear the way I rationalize keeping items. Hearing my rationalizations is a good way for me to “speak” to them and then the desire to hold onto them is usually loosened. One of my mantras is : Declutter from a place of Enough and with a mindset of the present – not the past of the future. Great advice Angela! Your wisdom will surely be a help in my decluttering process. My biggest challenges to decluttering – beyond the emotional attachment some items hold – is the possible value they hold. I have so much that could bring my family monetary benefits if placed on Ebay or consigned. There are many items that have been set aside to sell. Guess I need to either get a plan together to sell the items, or figure out how to part with them some other way.